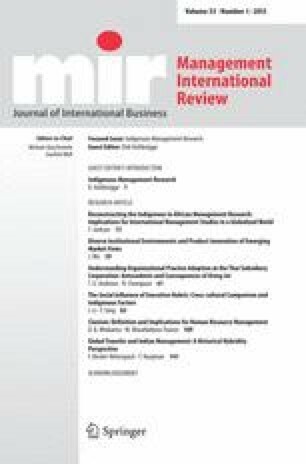 The primary aim of this article is to help lay the foundations for mainstreaming indigenous research within international and cross-cultural management studies, taking sub-Saharan Africa as the primary and initial focus, and using the informal economy as an example. It sets out to critically examine the concept of indigenous, looking at how concepts and scholarship have been shaped by global dynamics, and the implications for developing empirical management research. It then discusses a research agenda and methods for undertaking indigenous management research, going on to discuss the importance of this to the further development of international and cross-cultural management within a global and changing context. Its contribution to scholarship is a more systematic re-examining of the concepts of indigenousness and indigenous knowledge drawing on a range of disciplines and what these concepts mean to undertaking management research that more thoroughly reflect global realities, while evaluating indigenous research methods that could be used effectively and appropriately in this endeavour. Adams, A. V. (2008). Skills development in the informal sector of Sub-Saharan Africa. World Bank. http://info.worldbank.org/etools/docs/library/251006/day3SkillsfortheInformalApril1Se2.pdf. Accessed 9 Aug. 2010. Kenyon, T./World Bank (2007). How to encourage enterprise formalization: Some practical hints for policymakers in Africa. FIAS Policy Note. www.fias.net/ifcext/fias.nsf/AttachmentsByTitle/June2007PolicyNoteEnterpriseFormalization/$FILE/FIAS+Enterprise+Formalization+in+Africa.pdf. Accessed 18 May 2010. Porsanger, J. (2004). An essay about indigenous methodology. http://munin.uit.no/munin/bitstream/handle/10037/906/article.pdf?sequence=1. Accessed 1 July 2011. Schneider, F. (2002). Size and measurement of the informal economy in 110 countries around the world. A paper was presented at a workshop of the Australian National Tax Centre, Australian National University, Canberra, Australia, July 17, 2002. http://www.relooney.info/SI_Expeditionary/Shadow-Economy_13.pdf. Accessed 18 July 2012. Verick, S. (2006). The impact of globalization on the informal sector in Africa. Economic and Social Policy Division, United Nations Economic Commission for Africa (ECA) and Institute for the Study of Labor (IZA). http://www.iza.org/conference_files/worldb2006/verick_s872.pdf. Accessed 5 Aug. 2010.